We compiled and translated articles by Fu Sheng, CEO and founder of Cheetah Mobile, into this post in English. Cheetah Mobile is listed on the NYSE with a $2 billion market cap and is one of the first Chinese companies to go global. Fu is also the founder of a venture fund and his tips are invaluable to anyone interested in starting their own business. “A good entrepreneur is able to turn a highly open problem into a highly specific goal. Working hard is an attitude, not a goal,” he says. Read the full piece here. Tencent has drawn plenty of negative reviews after investing in a media startup, Cha Ping (差评), whose name literally means “negative reviews” in Chinese. Cha Ping, which publishes tech news, has been accused of plagiarism by several prominent independent media professionals and multiple media outlets. Cha Ping was supposed to receive $4.7 millions in funding from one of Tencent’s investment units. But the backlash caused by the announcement of the deal has made Tencent think twice. Tencent announced it will apply a more rigorous due diligence process and may withdraw its investment in Cha Ping. Specifically, Cha Ping is accused of “Xi Gao” (洗稿, literally “text laundering”), which means republishing other people’s content after rearranging paragraphs and minor editing. Cha Ping’s case has rekindled a debate in China’s media industry about what exactly constitutes plagiarism, and what is the boundary between borrowing and stealing others’ content. “90% of the news in the world is second-hand news, but even second-hand news has its ethics. You need to cite the sources properly and link to them,” read a commentary on Chinese tech media outlet PingWest, which counts itself as a victim of Cha Ping’s plagiarism. At the very least, the debate is an indication that, in a country where the attitude towards intellectual property used to be more cavalier, awareness about copyright issues is at an all-time high. 105% – The increase in Bilibili’s Q1 2018 net revenue compared to the same period last year. In the online video company’s first quarter as a public company, Bilibili reported strong growth driven by revenues from mobile games (which account for close to 80% of total revenue), live broadcasting, and advertising. Tencent has blocked links to videos on Douyin (抖音, whose overseas version is called Tik Tok)—one of China’s most popular short video apps owned by ByteDance (a.k.a Toutiao) on WeChat Moments, intensifying the rivalry between a tech giant and its up-and-coming challenger. 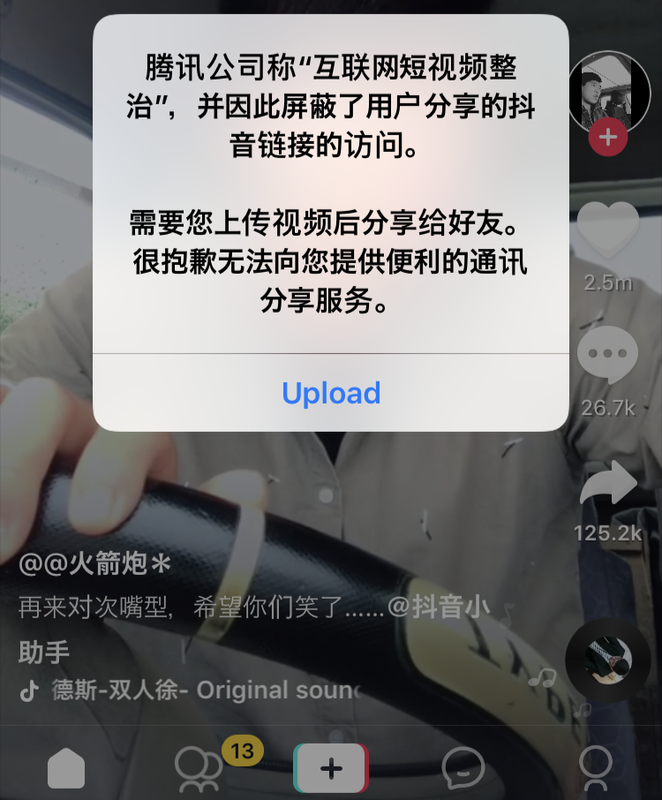 Now, users who want to share a Douyin video must download the video first and then post it on WeChat Moments as an original video (see screenshot below). Douyin’s meteoric rise in the past year has threatened the dominance of Tencent’s apps. According to QuestMobile, Douyin’s daily active user base grew from 10 million in August 2017 to 40 million in January 2018. Following the incident, ByteDance published a statement through its official WeChat account denouncing Tencent’s unfair treatment. Tencent has its own ambitions in short videos, a format that is increasingly replacing live streaming to be the national favorite for entertaining content. In 2013, Tencent launched its own short video app Wei Shi (微视) which never took off and was closed down in April 2017. Around the same time, Tencent led a $350 million investment round in Kuaishou, China’s most popular short video app and Douyin’s biggest competitor. Last month, Tencent relaunched Wei Shi with new features in hopes of challenging Bytedance’s apps. Alibaba’s Koubei, a local-services platform, has transformed a traditional restaurant to keep up with modern consumers. Watch here. In the first joint live session of GGV Capital’s 996 Podcast and The Sinica Podcast, we interviewed Yasheng Huang, a renowned economist and Professor of Global Economics and Management at the MIT Sloan School of Management. We were joined by Kaiser Kuo, host of the Sinica Podcast and producer of the 996 Podcast. Professor Yasheng Huang founded and runs the China Lab and the India Lab at MIT, which aim to help entrepreneurs in those countries improve their management skills. He is an expert source on international business, political economy, and international management. In collaboration with other scholars, Huang is conducting research on human capital formation in China and India, entrepreneurship, and ethnic and labor-intensive foreign direct investment. In this episode, we discussed the recent trade tensions between the US and China, how geopolitical factors are impacting the global tech industry, and how China’s growth story compares to that of India and other developing countries.